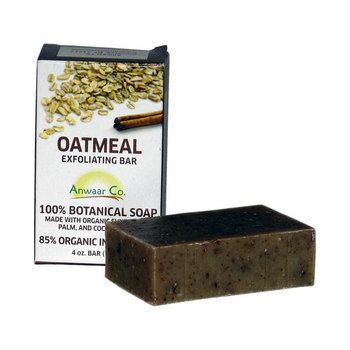 Nourish your skin with the natural lather of Anwaar's Oatmeal and Spice Exfoliating Bar. Organic oatmeal naturally exfoliates dry, dead skin, refreshing it with each use. This soap is the ideal daily cleanser for all skin types, especially dry, sensitive skin. Start the healing today. NATURAL OATMEAL EXFOLIATES AND REFRESHES YOUR SKIN WITH EVERY USE. THIS NATURAL SOAP CONTAINS NO GMO'S AND NO SYNTHETIC FRAGRANCES OR COLORANTS. CERTIFIED ORGANIC BY THE MONTANA DEPARTMENT OF AGRICULTURE IN COMPLIANCE WITH THE USDA NATIONAL ORGANIC PROGRAM. All natural ingredients: saponified oils of sunflower, palm, coconut and olive (with retained glycerin); pure essential oils; oats; ground cloves; shea butter; grapefruit seed extract; rosemary extract.